A Comic Expert Sees "Green Lantern"
From the opening narration to the repeated discussion of Will vs. Fear, to the constant recounting of action that happens off-screen to the skipping over of other important moments to the awkward editing, “Green Lantern” has to stand as one the worst pieces of storytelling this year. “Green Lantern” stars Ryan Reynolds as Hal Jordan, a skirt-chasing test pilot for Ferris Aircraft, the company owned by the father of his lifelong friend and occasional bedmate Carol, played by Blake Lively. One day Hal finds himself scooped up by a mysterious green light and whisked through the sky to the site of a crashed spaceship, where an alien tells him that "the ring" has chosen him to be the next member of the Green Lantern Corps, a collection of 3,600 warriors powered by the force of Will to protect the people of the universe from Fear - and, more specifically, a giant lava-like blob called Parallax. It’s your classic “Chosen One” story, with the attendant “You’ve got the wrong guy” reservations on the part of the reluctant hero. Yet for reasons beyond human comprehension, this takes director Martin Campbell almost 40 minutes to explain it all. It’s funny, too, because Campbell’s “Casino Royale” took off like a shot, but here he takes an eternity to get the ball rolling. Yes, Bond has the advantage of having a well-established backstory, and, yes, “Green Lantern” is a second-tier hero whose story isn’t as well known. But Campbell could’ve easily made that work to his advantage, allowing him to take more shortcuts without having to withstand the howling of a billion fanboys. 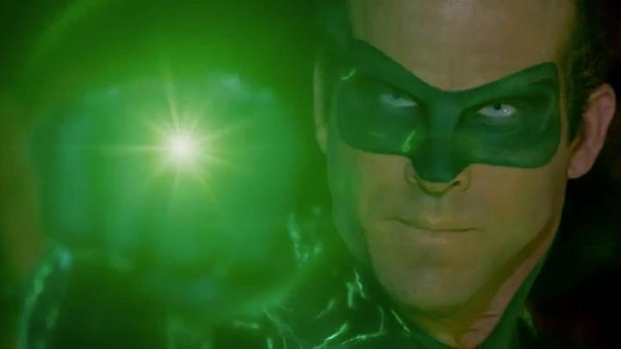 See New 3D "Green Lantern" Trailer in Glorious 2D! Ryan Reynolds stars as test pilot Hal Jordan, who is recruited into a corps of intergalactic guardians charged with protecting the universe from the lies of the evil Dr. Hector Hammond. 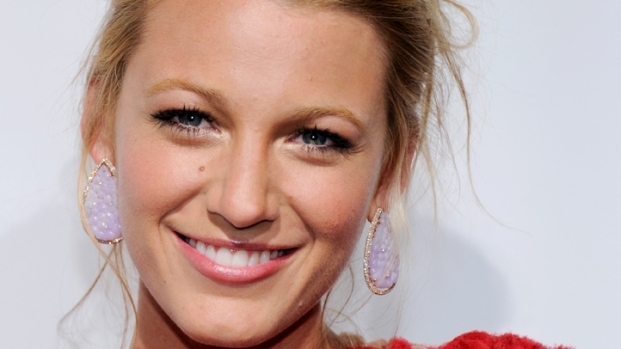 Co-starring Peters Sarsgaard and Blake Lively, opens June 17. One of the film’s few bright spots is Peter Sarsgaard’s performance as Dr. Hector Hammond, who starts out as a balding, sweaty lab rat and morphs into a fleshy-headed mutant with telepathic powers after coming into contact with some yellow Fear. Sarsgaard’s Hammond is all twitchy and moist and hunched and brimming with rage—rage that would resonate more if we’d been told at some point earlier in the film that he has a relationship with Hal and Carol that goes back to when their kids. Alas, Campbell couldn’t find time to wedge that piece of info into the film’s first half, so he just drops it into a line of dialogue, much to late for it to matter. Of course, it’s unfair to lay all the blame for the story, such as it is, at Campbell’s feet, as the film did have four guys who got writing credits—never a good sign. And not only is the story itself a mess, the tone is all over the place. 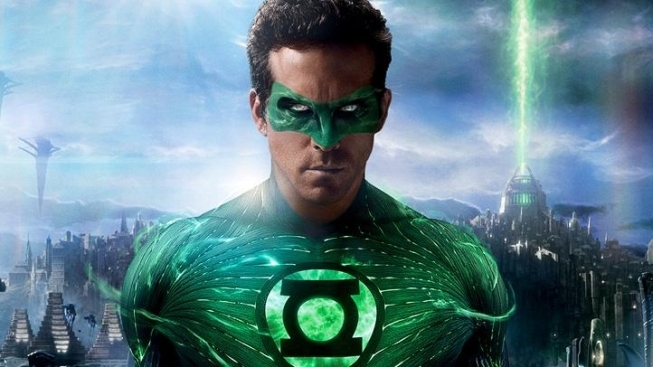 Reynolds’ Green Lantern hearkens back to the pre-“X-Men” era of superhero movies, when the prevailing attitude was dopey humor and a knowing wink that said, “Let’s not take this seriously.” But in the past decade-plus it’s been proven time and again that a successful superhero movie has to take itself at least a little seriously for it to resonate. Reynolds proved himself capable of playing heavy in last year’s “Buried,” but it’s the glib, too-cool Reynolds that prevails here—pity. On a purely visual level, "Green Lantern" is just OK. The 3D is barely noticeable (not a compliment), you'd do well to see it in 2D and save a little more money if you just have to see it. The planet Oa is a little silly, the Guardians look awfully familiar and Geoffrey Rush's fish-headed Green Lantern is just inane, regardless of how true to the comic it is. But Parallax, the giant yellow-and-black lava-like squid monster looks pretty awesome twisting its way across the city. As is the custom of the day, halfway through the closing credits of “Green Lantern,” there’s a teaser that sets up the second chapter in the “green space cop’s” saga, and maybe it will be better now that they’ve gotten past the insanely tedious origin story. But if you somehow survive "Green Lantern," you’ll be hard pressed to go back for more. Blake Lively Goes Brunette For "Green Lantern"
Blake Lively chats about her role as Star Sapphire in the upcoming comic book movie, "Green Lantern." Find out what she thinks of the footage she's seen. Plus, why did she really dye her hair brown for the role?